Having been inspired by youtube videos and some photos I saw on the web I decided to revisit Prentice Cooper State park for my Father’s Day adventure. I had been there about ten years ago but I only drove one trail. I am still not sure which trail that was but there was a big warning sign saying only 4×4 vehicles were allowed past that point. This is Haley Road which all the reviews said was the gnarlyist trail there. On Saturday, we were at another event near the park so we took the Suburban and drove the main road called Tower road. It was closed at one point for Turkey Nesting. We tried a few side roads but they were narrow and the Suburban is hard to turn around so we did not venture off the main road. We did find the marker for Haley road so we knew where to go in the Jeeps. We returned on Sunday with two Jeeps. Since my off road Jeep is still suffering from worn ball joints, I took my daily driver. 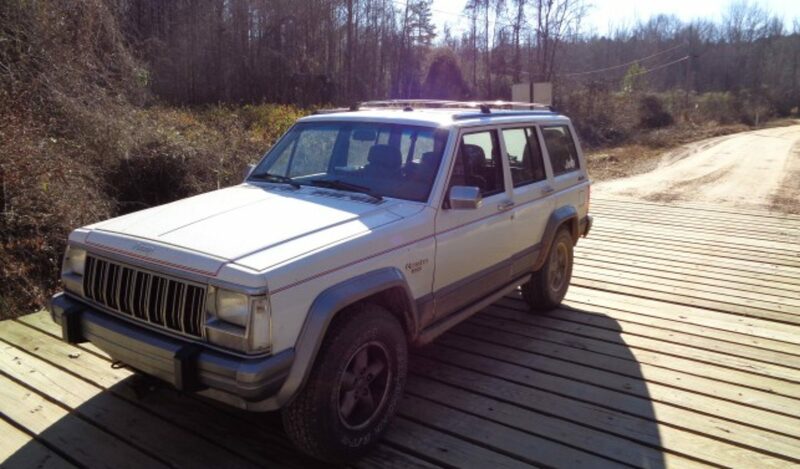 This Cherokee has 30″ BFG ATs that are pretty worn. Open differentials and slight less than stock ride height. Jenny’s Jeep has 31″ Maxxis Buckshots and a three inch lift. Also open diffs. Taking the street Jeep allowed Janice and my son will to ride along. Jenny had all three of her kids with her. We stated on Persimmon road. Our map showed it connected to Haley Rd. We made a few turns that turned out to be dead ends and then came to a spot where a tree blocked the road. There was an ATV bypass but there was no way to get my Jeep through. So we turned around. We then made our way to Lusk Point via Sulphur rd. I could have driven the Suburban on this one. The view from Lusk point was beautiful. We had a picnic lunch here. We drove out on Lusk Point Rd and found a Honda stuffed into some trees along Tower road. Not sure how she got there. Both air bags were deployed but every one seemed OK. She had lots of family there to assist but was still stuck. I hooked up my tow rope and pulled her back on to the gravel road. I left her family to deal with getting the car home from there. She said she was on her way to visit her father’s grave for father’s Day. Glad she did not join him there. He headed on down to Haley road. Just a short way in is one of those 4×4 only signs. I stayed in 2wd just to be stubborn until I got tired of using the brakes to hold back on the hills. If I had two low I would have used that. We dropped down a rocky hill and crossed a shallow creek. I kept waiting for the good part. After the creek, the road smoothed out. After rewatching the first video above, I realized that was the good part. Near the end of the road we did find the rock ledge pictured in the second Video. I took the bypass and spotted Jenny on her way down. After looking at the hill form the bottom, I decided to go up it. I took a line slightly right of the Dodge in the video and made it up easily. Jenny then turned around and drove up as well. We drove on to see if the road really did intersect HWY 27 like the map said. Sure enough it did. Funny that there is not one of those 4×4 only warning signs on that end. Just a sign with lots of park rules. There is a funny sign that says Speed limit 1 MPH. I think there is a number missing. We headed back in to try a side road we saw that looked interesting. No name ion this one but the map showed it went back in the direction we first tried on Persimmon Rd. This road turned out to be the most fun all day. There were several climbs that looked like there would be no way a stock Jeep on 30s could make it. But my little Jeep just crawled up with ease. I hardly spun the tires. I was thinking that going back down some of those might be interesting. About that time I met a Chevy Pickup across the road. I got out to chat and found there was a tree across the road. None of us had a saw and the bypass was too narrow for even our Jeeps, much less the Chevy. After a meet and greet, we turned around to head back down. That is when Jenny’s Jeep balked. Princess did not want to leave. She bucked and snorted and refused to run. There was vapor in the fuel rail. We could hear the pump running but it was boiling before it got to the injectors. After a long discussion about carburettors and propane while the ice melted on her fuel rail Princess fired up. It would run fine if the RPMs were over 2000 but if it got below she would die. More ice on the fuel rail was needed to get her to restart. Driving down the tricky trail was made even more exciting for Jenny by trying to keep her Jeep running. Loosing power brakes and power steering while going down the tricky rocks was a real challenge. It took a while but we finally made it back to Haley Road. We chose to drive the short way out and take HWY 27 home. It was a fun day in the woods and I do want to go back and explore some of the other side roads. But I do have to laugh at the folks who said Haley rd was really gnarly. My stock Jeep Cherokee made it look easy.